University of Nebraska-Lincoln scientists led a study that reports the first in vivo evidence that strains of chimpanzee-carried simian immunodeficiency virus can infect human cells. From left, Wenjin Fan, Qingsheng Li, Zhe Yuan and Guobin Kang. Li is an associate professor of biological sciences at UNL, Fan and Yuan are doctoral students and Kang is a research technologist. But in the early 1900s, probably near a West African rainforest, it’s thought that a hunter or vendor of bush meat – wild game that can include primates – acquired the first strain of a simian immunodeficiency virus that virologists consider the ancestor of HIV. A new study led by the University of Nebraska-Lincoln has supported this hypothesis by reporting the first in vivo evidence that strains of chimpanzee-carried SIVs can infect human cells. They include the SIV ancestor of HIV-1 M – the strain responsible for the global HIV pandemic – and another ancestral strain of HIV found only among residents of Cameroon. Li and his colleagues came to the conclusions after inoculating mice that were implanted with human tissues and stem cells, which stimulated the growth of other cells essential to the human immune system. To explore why humans have acquired certain HIV strains while avoiding others, the team injected low doses of the four SIV strains into separate groups of the mice. The authors found that the inferred SIV forerunners of HIV-1 M and the Cameroon-specific strain required fewer opportunities to infect the mice than did the two SIV strains whose HIV descendants have not been found in humans. According to Li, this may stem from the fact that the genetic makeup of the latter two strains differs more from HIV-1 M than does the Cameroon strain, which shares more genes with its pandemic cousin. 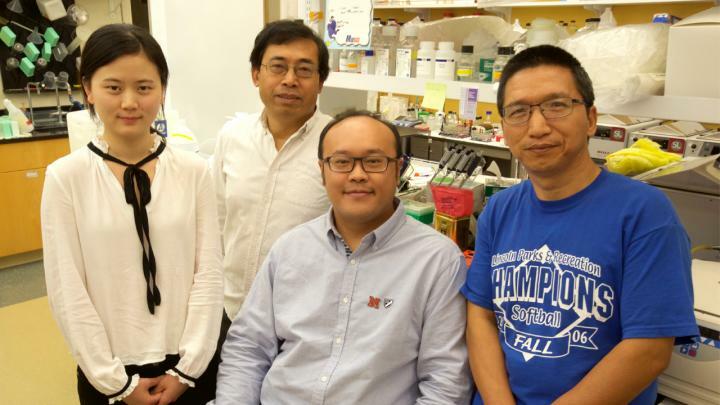 “Based on our experiments, we clearly see some differences between the strains,” said Li, whose team collaborated with the Frederick National Laboratory for Cancer Research. “That implies that there might be differences in the likelihood of cross-species transmission when a person is exposed to one strain versus another.”The team also found evidence for the long-suspected notion that SIV strains mutate upon entering cells to overcome human-specific barriers to infection. Within 14 weeks, the same viral gene in two different SIV strains – including the ancestor of HIV-1 M – regularly underwent mutations at two key positions on that gene. Li and lead author Zhe Yuan, a doctoral student in biological sciences, said the recent outbreak of the Zika virus – which remained relatively quiet for decades following its 1947 discovery in a monkey – underscores the value of pre-emptively identifying viruses that can jump from animals to humans. The experimental approach employed by the team could help assess the threat posed by additional SIVs and numerous other animal-carried viruses, Yuan said. This could prove especially vital given the dynamic nature of HIV and other zoonotic diseases, he said, many of which have caused new epidemics or even pandemics.